The Shichifukujin 七福神 are an eclectic group of deities from Japan, India, and China. Only one is native to Japan (Ebisu) and Japan’s indigenous Shintō tradition. 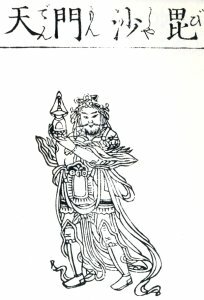 Three are deva from India’s Hindu pantheon (Benzaiten, Bishamonten, Daikokuten) and three are gods from China’s Taoist-Buddhist traditions (Fukurokuju, Hotei, Jurōjin). In my mind, it is more fruitful to explore the seven within a Deva-Buddha-Kami (Hindu-Buddhist-Shintō) matrix rather than a standard binary Buddha-Kami model. For that reason, I have devoted most of my research to the three Hindu deva. Today images of the seven appear with great frequency in Japan. In one popular Japanese tradition, they travel together on their treasure ship (Takarabune 宝船) and visit human ports on New Year’s Eve to dispense happiness to believers. Children are told to place a picture of this ship (or of Baku, the nightmare eater) under their pillows on the evening of January first. Local custom says if they have a good dream that night, they will be lucky for the whole year. Each deity existed independently before Japan’s “artificial” creation of the group. The origin of the group is unclear, although most scholars point to the Muromachi era (1392-1568) and the late 15th century. By the 19th century, most major cities had developed special pilgrimage circuits for the seven. These pilgrimages remain well trodden in contemporary times, but many people now use cars, buses, and trains to move between the sites. The group’s seven members have varied over time and did not become standardized until the late 17th century. 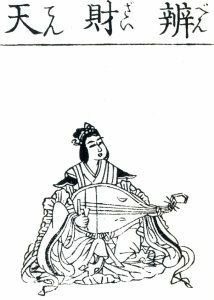 In the beginning, Benzaiten was not a member of the ensemble. One later configuration included both Kichijōten and Benzaiten, but excluded Fukurokuju. Today the standard group consists of Ebisu, Daikokuten, Bishamonten, Benzaiten, Hotei, Jurōjin, and Fukurokuju. This INTRO PAGE provides a brief history of the group. For full textual reviews and photos of any single deity, click that deity’s name. Why the number seven? Details here. 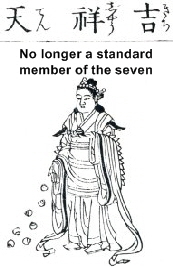 Earliest extant pictorial example of all seven in the standard set. Arts and Music. Above photos from art historian Patricia Graham. One of the oldest extant drawings of an abbreviated assemblage of the group. 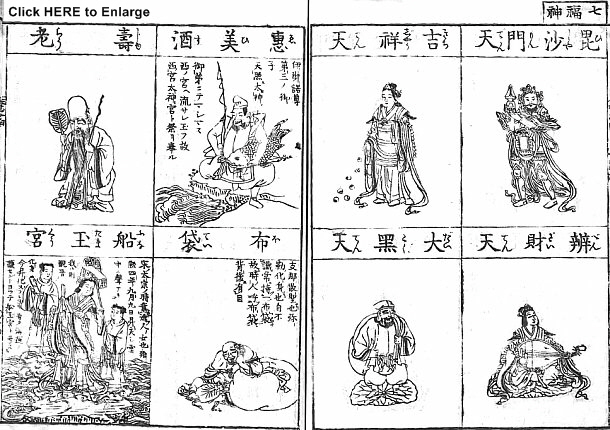 Five of the Gods of Fortune 五福神図, by Kanō Tanyū 狩野探幽 (1602-1674). Ebisu (fish), Daikokuten (rice bale), Bishamonten (spear), Benzaiten (biwa), Hotei (big bag & fan). Photo from this J-site. I’m not sure, but I think this piece is at the University Art Museum, Tokyo National University of Fine Arts & Music. 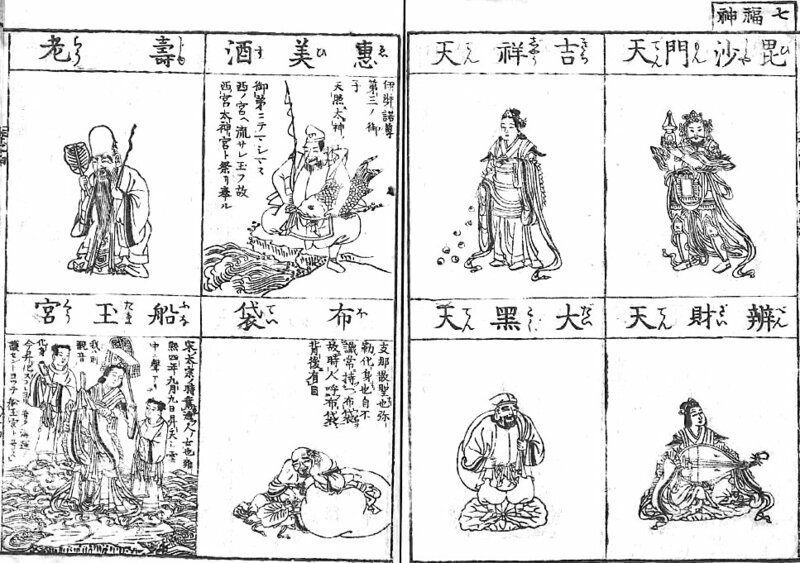 Seven Gods of Good Fortune, the standard set, early 19th century. huge white bag by Hokusai Katsushika. Photo from this J-site. However, art historian Patricia Graham, p. 112 says: “Twentieth-century sources credit the priest Tenkai, Ieyasu’s advisor, with concocting the grouping for the edification of the third shogun, Tokugawa Iemitsu. 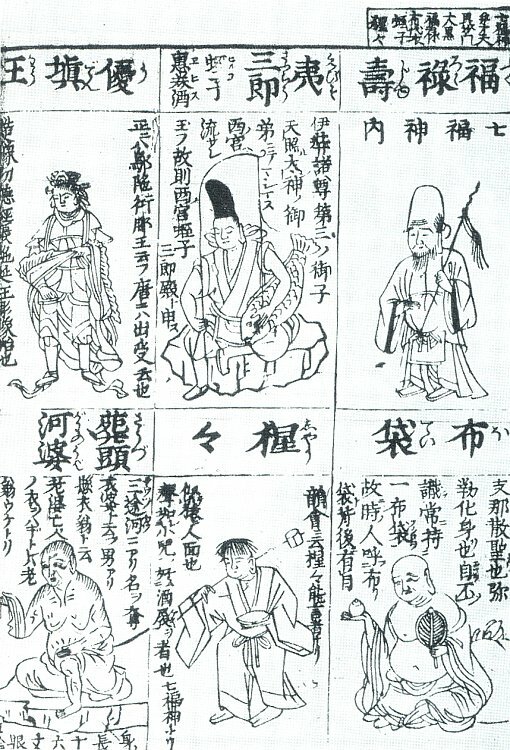 These sources explain that Tenkai identified the individual gods with seven virtues (longevity, fortune, popularity, candor, amiability, dignity, magnanimity) that kings impart to their subjects if they [the kings] follow the teachings of the Sutra of the Benevolent Kings (Ninnō-kyō 仁王經). However, Tenkai’s known writings and Rinnōji Temple 輪王寺 records make no mention of the Seven Gods.” See below table for deity-virtue identifications. Drawing of the Treasure Boat. Kanji in sail says TREASURE 宝.
Saga Pref. Photo this J-Site. Hat of Invisibility = Kakuregasa 隠れ笠, and Cloak of Invisibility (Lucky Raincoat) = Kakuremino 隠れ蓑. Allows one to perform good deeds without being seen. Robe of Feathers = Hagoromo 羽衣. A long loose flowing garment giving one the gift of flight. Attribute of Benzaiten. Magic Mallet, Mallet of Good Fortune = Uchide no Kozuchi 打出の小槌. Brings forth money when struck against an object or when shaken. Common attribute of Daikokuten. Bag of Fortune = Nunobukuro 布袋 (lit. cloth bag). Includes an inexhaustible cache of treasures, including food and drink. Common attribute of Hotei. Never-Empty Purse or Moneybag = Kanabukuro 金袋. Bag of unlimited wealth, prosperity & fortune. Key to Divine Treasure House = Kagi 鍵. The treasure house is symbolized by the stupa (pagoda) held by Bishamonten. Rolls of Brocade = Orimono 織物. Scarves and clothing were considered treasures in ancient times and used in various rituals. Not sure of its meaning here. 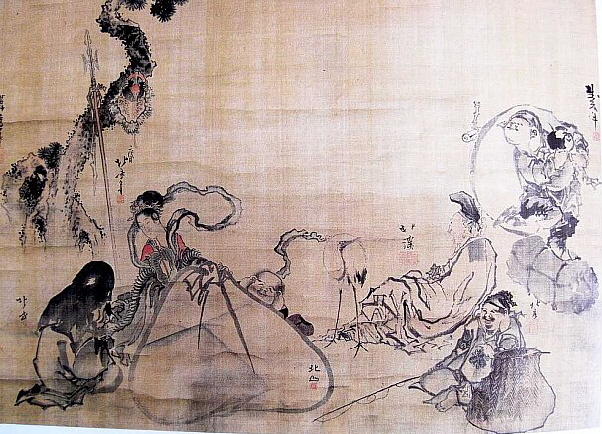 Scrolls of Wisdom & Longevity = Makimono 巻物. Common attributes of Jurōjin and Fukurokuju, who are said to be two different manifestations of a single deity (the god of wisdom and longevity). More details in Chiba Reiko’s book (pp. 9-12). Votive Tablet (EMA 絵馬) from Enoshima Jinja 江島神社 (Enoshima Shrine). Modern. treasure and a protector of both shrines and temples. Auspicious and long-lived cranes appear in the sky. Kaiun Shōfuku 開運招福, which means "Inviting Good Luck, Fortune and Prosperity." Enoshima Shrine is one the Three Great Benzaiten Sanctuaries (Nihon Sandai Benten 日本三大弁天) in Japan -- hence the characters 日本三大弁天 appear as well. Edo-period (1603 to 1868) painting of the seven on their dragon-headed boat. Wood, 180 cm X 100 cm. This painting served as the “model” for many subsequent paintings of the seven, as shown below. It also depicts the luck-bringing crane, Mount Fuji, and the red-rising sun. Photo from this this J-site (location not given). 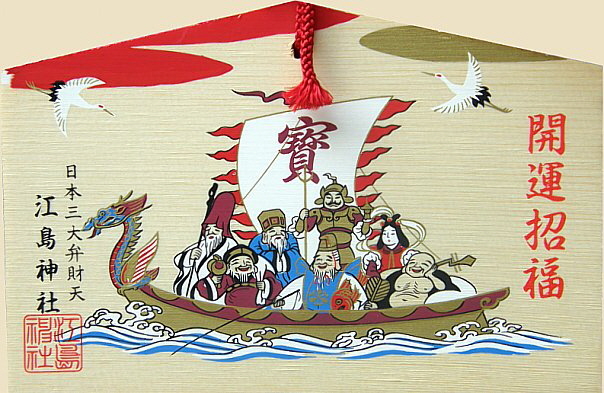 Seven Lucky Gods Riding a "Namazu" Treasure Boat. Entitled 繁昌たから船, Late 19th Century. to everyone. 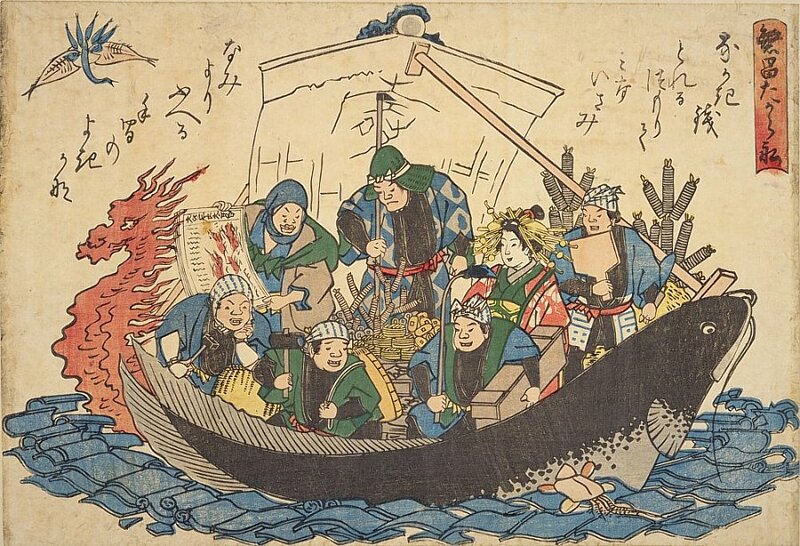 The boat is typically shaped like a dragon, but in this print it is shaped like a catfish (namazu). Namazu is a giant catfish thought to live deep inside the earth. Its movements are said to cause earthquakes. by roof tiles, while the namuza is subdued by a mast-supporting wooden pole. A lucky crane, turtle and dragon appear as well. Photo this this J-site. By the 19th century, most major cities had developed special pilgrimage circuits for the seven. These pilgrimages remain well trodden in contemporary times, especially during the first three days of January. But today, many people use cars, buses, and trains to move between the sites rather than walking. To document their journey, some pilgrims purchase a rectangular stamping sheet at their first location -- called a Kinen Shikishi 記念色紙 -- then present it to each successive temple or shrine for stamping. 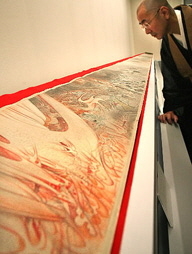 An example of a fully stamped kinen shikishi is shown below. reportedly the oldest circuit devoted to the seven in Japan. Photo courtesy this J-site. ABOVE ILLUSTATION. Modern-day poster (2008). Found at Myōryūji Temple 妙隆寺 in Kamakura. 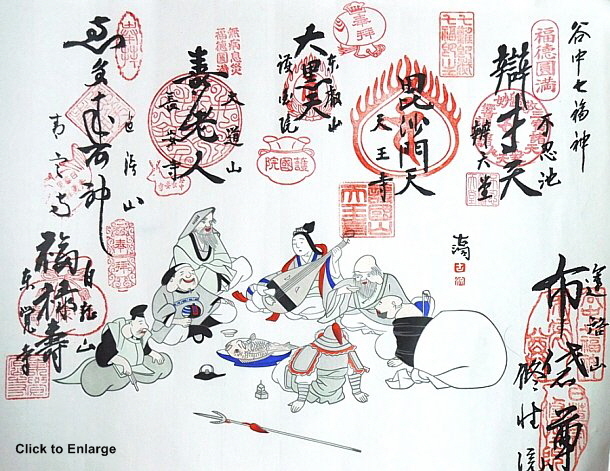 The temple also sells this image as a shikishi 色紙 (colored sheet of paper used for calligraphic poems or paintings). Myōryūji Temple is the seventh site on the Kamakura Pilgrimage to the Seven Lucky Gods. It honors Jurōjin. To document your pilgrimage, buy a rectangular stamping sheet, called a kinen-shikishi 記念色紙. You buy this at your first destination (1,000 yen), then at each successive stop in the circuit of seven, hand it to the temple office for stamping. Another equally curious tradition still widely practiced in Japan is that of rubbing Daikoku or Hotei. When visiting temples that enshrine statues of the seven deities, visitors often rub the head / shoulders of Daikoku (the god of wealth and business prosperity). Doing so is said to bring wealth - which rubs off the statue onto the rubber. Photo at right shows life-size wooden Daikoku statue at Hase Dera in Kamakura -- the sign at his feet says “Rubbing Daikoku -- Please Touch” Also, rubbing the stomach of Hotei is said to bring good luck. 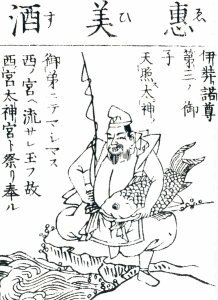 Holds a fish (TAI, sea bream or red snapper), which symbolizes luck and congratulation (Japanese word for happy occasion is omede-TAI); fishing rod in right hand; folding fan in other; grants success to people in their chosen occupations; son of Daikoku. Popular among fishing folk, sailors, and people in the food industry. 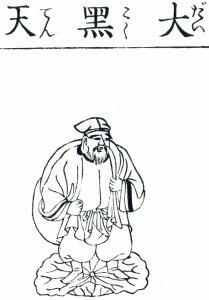 God of five cereals; rice bales; treasure sack (bag); magic mallet in right hand; sometimes wears hood; rat (found around food); often shown with Ebisu, who is said to be his son; merged with Shinto deity of good harvests, Okuninushi no Mikoto. Also a member of the TENBU. Popular among farmers, agricultural businesses, & traders. Japanese mandolin, lute, magic jewel, snake, sea dragon. Only female among the seven. Member of the TENBU grouping. Popular among artists, musicians, and writers. Bag of food and treasure that never empties; oogi (fan), small children at his feet; supposedly only member of seven based on actual person (although Jurōjin / Fukurokuju might also be based on real person); known as the Laughing Buddha; rubbing his stomach is said to bring good luck; incarnation of Bodhisattva Maitreya (Jp. = Miroku). Popular among bartenders and all classes of people. Best known of the seven outside Japan. 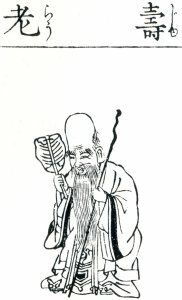 Huge elongated head; long white beard, cane with sutra scroll, crane, deer, stag, tortoise (symbols of longevity); scroll said to contain all the wisdom in the world; said to inhabit same body as Jurōjin (the pair are two different manifestations of the same deity); wields power to revive the dead. Popular among watchmakers, athletes, others. 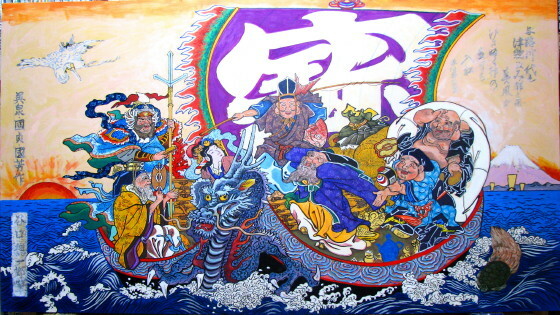 Wears armor, carries spear and treasure pagoda; centipede is messenger; Vaisravana in Sanskrit; also known as Tamonten (the commander of the Shitenno or Four Heavenly Kings), and a member of the TENBU Popular among soldiers, doctors, and certain Buddhist monestaries; the only member of the Shitenno worshipped independently. Goddess of fortune, luck, beauty, and merit. From the 8th century onward, she was a central devotional deity among some Japanese sects, and was given individual cult status as an object of Buddhist worship. But since the 15th / 16th century, her imagery and attributes were largely supplanted by the Goddess Benzaiten (Benzaiten is now the only female among Japan’s Seven Lucky Deities). 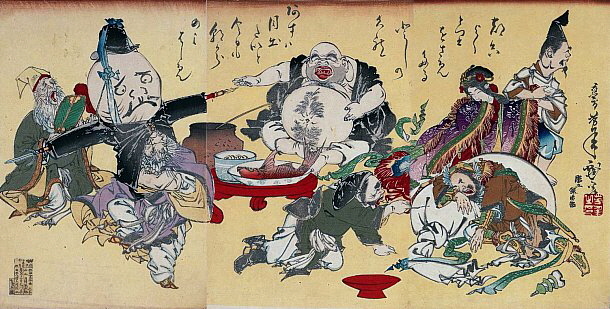 Kichijōten appeared as one of the seven lucky deities in the 1783 Zōho Shoshū Butsuzō-zui 増補諸宗仏像図彙 (see images below), but since then she has been dropped from the group. 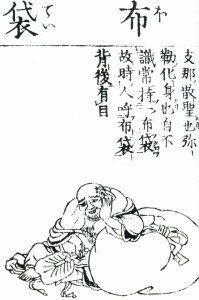 A nonstandard member of the group, Shōjō (a sea-dwelling sea sprite, fond of drinking, and hence typically colored red) appeared in the 1690 Butsuzō zu 仏像図彙 (Illustrated Compendium of Buddhist Images; see images below), but has since been dropped. For more details, please see Gabi Greve’s page. In Japan, there is another goddess/god (of Hindu origin) named Marishiten. Introduced to Japan in the early 9th century, s/he is revered as a tutelary deity of the warrior class. In her female form, she is the consort of Dainichi Nyorai (Skt. = Vairocana), the Great Solar Buddha. In this role, she is the harbinger of Dainichi, the Goddess of Dawn, a personification of light, one identified with the blinding rays & fire of the rising sun, and thus with the power of invisibility and mirage. In later centuries, she was worshipped as a goddess of wealth and prosperity among merchants and gamblers (most likely for her powers of illusion). S/he was counted along with Daikokuten 大黒天 and Benzaiten 弁財天 as one of a trio of "three deities" (Santen 三天) invoked for good fortune during the Edo era. Marishiten has been largely supplanted by Benzaiten. In Japan’s Muromachi Era (1392-1568), an esoteric three-headed form of Daikokuten emerged that combined the head’s of Daikokuten, Benzaiten, and Bishamonten. All three are members of the Seven Lucky Gods. This 3-headed version of Daikokuten is is believed to protect the Three Buddhist Treasures (the Buddha, the law, and the community of followers). This iconography is very similar to another kitchen deity named Kōjin-sama. As the three-headed deity, Sanmen Daikoku awards followers with wealth and virtue. Important Note: The member’s of the Seven Lucky Gods have varied over time. 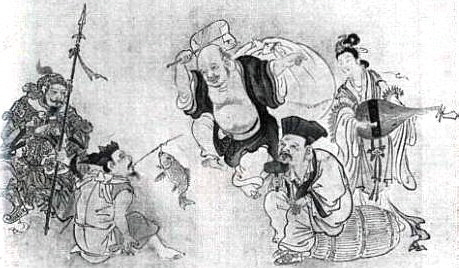 In the beginning, Benzaiten was not a member of the group. 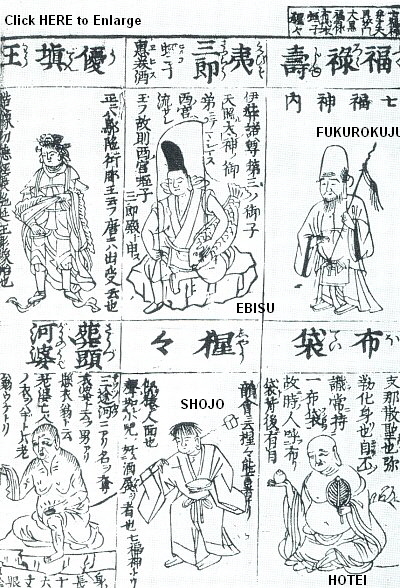 One later grouping included both Kichijōten and Benzaiten, but excluded Fukurokuju. In modern Japan, the group nearly always consists of Ebisu, Daikokuten, Bishamonten, Benzaiten, Hotei, Jurōjin, and Fukurokuju. Butsuzō-zu-i 仏像図彙 (Illustrated Compendium of Buddhist Images) was first published in 1690 (Genroku 元禄 3) and has since become a major authority on Japanese Buddhist iconography. Hundreds of pages and drawings, with deities classified into approximately 80 (eighty) categories. From the 1690 Butsuzō zui 仏像図彙 (Illustrated Compendium of Buddhist Images). Source: Tokyo Metropolitan Central Library. Seven Gods of Good Fortune by Hokusai Katsushika 葛飾北斎 (1760-1849). Photo this J-site. Photo also at this J-site and also here. Seven God of Fortune, artist unknown. Perhaps by Maruyama Ōkyo 円山応挙 （1733-1795). Photo this J-site. 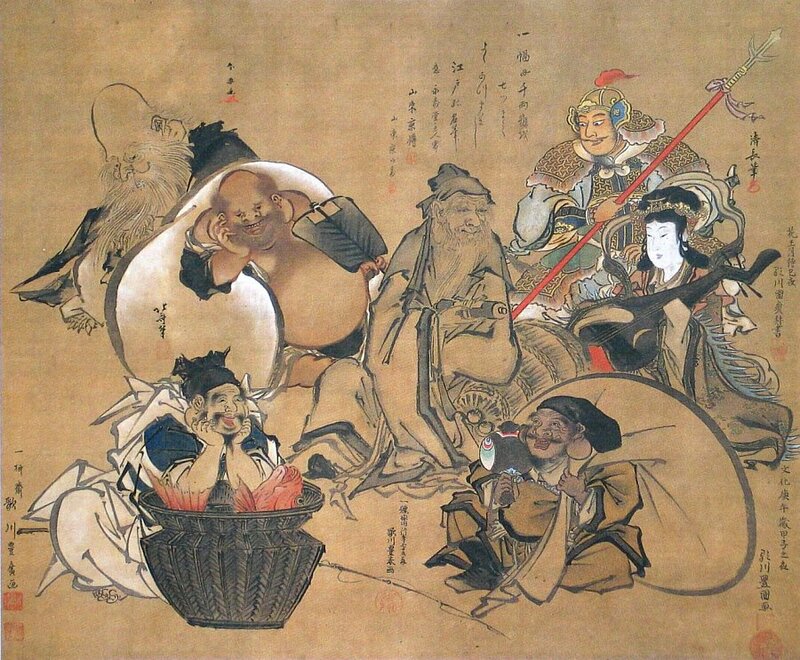 Seven Gods of Fortune (1882) by Yoshitoshi Tsukioka 芳年月岡 （1839-1892). Here we see the seven indulging in drunken revelry. Photo this J-site. WHY THE NUMBER SEVEN ? The Shichifukujin are an excellent example of the way Hindu, Buddhist, and Shinto beliefs live side by side in Japan, influencing one another, and even lending each other gods ! 七難七福図巻 Handscroll of Seven Adversities & Seven Fortunes, 1768. The Japanese people appear bewitched by the number seven -- much like the rest of the world. The West, for example, had its seven wonders of the world. Rome, it is said, was built on seven hills. Medieval Christians counted seven deadly sins. In the age of discovery, explorers traveled the seven seas. The modern world revolves around a seven-day week. People still say they are ”in seventh heaven" when they are extremely happy (a phrase that originated in Dante’s The Divine Comedy). This obsession with number seven no doubt reflects the visibility of the seven-star Big Dipper and the seven planets (Sun for Sunday, Moon for Monday, Mars for Tuesday, Mercury for Wednesday, Jupiter for Thursday, Venus for Friday, Saturn for Saturday). The mystery of number seven has enraptured the Japanese as well. Ancient Japan was founded around seven districts. 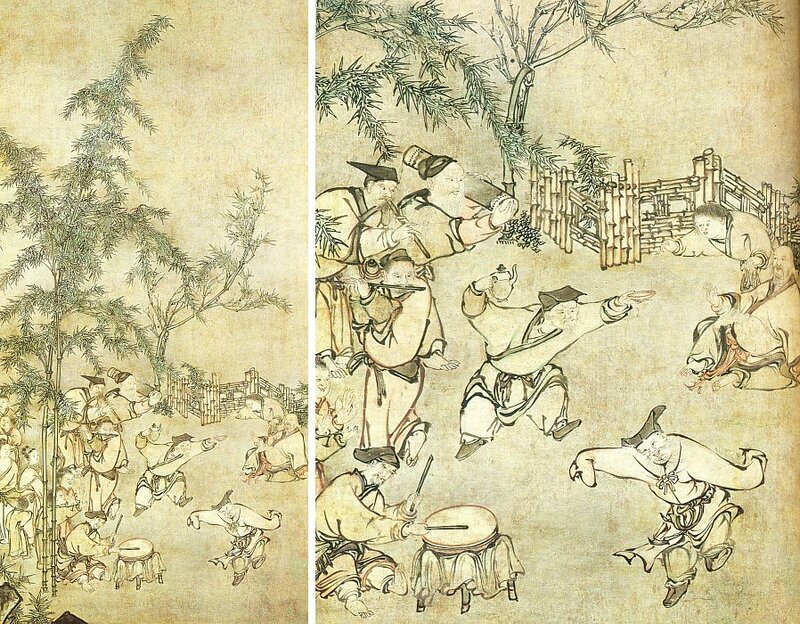 In Japanese folklore, there are seven Buddhist treasures and seven deities of good luck (the topic of this story). Japanese Buddhists believe people are reincarnated only seven times, and seven weeks of mourning are prescribed following death. The list goes on and on -- the seven ups and eight downs of life, the seven autumn flowers, the seven spring herbs, the seven types of red pepper, the seven transformations, and the popular 7-5-3 festival held each November for children, in which special Shinto rites are performed to formally welcome girls (age 3) and boys (age 5) into the community. Girls (age 7) are welcomed into womanhood and allowed to wear the obi (decorative sash worn with kimono). First month, first day = Kochōhai 小朝拝, New Year Celebration, together with the seventh day after the New Year known as Jinjitsu 人日 or Nanakusa no sekku 七草の節句 (feast of seven herbs). Fifth month, fifth day = Tango no sekku 端午の節句 or Boys’ Festival. Seventh month, seventh day = Kikkouden 乞功奠 or Tanabata 七夕 Festival. Over the centuries several of the festivals changed dates or names. For example, when Japan adopted the solar calendar in 1872, the feast of seven herbs was moved from the 7th of the lunar calendar to the 7th day of January. In addition, the third month festival became the Hinamatsuri 雛祭 or Doll Festival. We should also mention that, in the lunar calendar, the new moon (1st of the month), the half-moon of the first quarter (7th or 8th), the full moon (15th), and the half-moon of the last-quarter (22nd or 23rd), are considered sacred days and known as Hare-no-hi 晴れの日. All other days of the months are known as Ke-no-hi 褻の日. Until modern times, Japan's most important festivals were almost always held on Hare-no-hi days. See Zodiac Calendar page for more details. In addition, star worship may have played a role in the 5-7 syllable pattern of Japanese poetry. The five planets (each linked to one of the five elements), along with the sun and moon, are known as the seven celestial bodies (Shichiyō 七曜). Each is associated with a specific deity, day of the week, and compass direction. The seven stars of the Big Dipper have likewise been deified. See planets and stars page for more details. 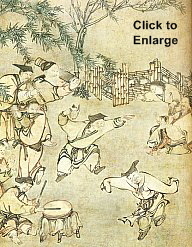 Butsuzō zui 仏像図彙 (Illustrated Compendium of Buddhist Images). Published in 1690 (Genroku 元禄 3). A major Japanese dictionary of Buddhist iconography. Hundreds of black-and-white drawings, with deities classified into categories based on function and attributes. For an extant copy from 1690, visit the Tokyo Metropolitan Central Library. An expanded version, known as the Zōho Shoshū Butsuzō-zui 増補諸宗仏像図彙 (Enlarged Edition Encompassing Various Sects of the Illustrated Compendium of Buddhist Images), was published in 1783. View a digitized version (1796 reprint of the 1783 edition) at the Ehime University Library. Modern-day reprints of the expanded 1886 Meiji-era version, with commentary by Ito Takemi (b. 1927), are also available at this online store (J-site). In addition, see Buddhist Iconography in the Butsuzō-zui of Hidenobu (1783 enlarged version), translated into English by Anita Khanna, Jawaharlal Nehru University, New Delhi, 2010. Graham, Patricia. Faith and Power in Japanese Buddhist Art (1600-2005), pages 109-115. World-class scholarship concerning Japan’s religious history & icons. University of Hawai’i Press, 2007. Handbook on Viewing Buddhist Statues 仏像の見方ハンドブック. By Ishii Ayako. A wonderful book. Published 1998. Japanese Language Only. 192 pages; 80 or so color photos. ISBN 4-262-15695-8. JAANUS. Japanese Architecture and Art Net Users System. A wonderful online dictionary compiled by the late Dr. Mary Neighbour Parent. It covers both Buddhist and Shinto deities in great detail. Over 8,000 entries. Written in English, yet presenting all key terms in Japanese. Buddhism (Flammarion Iconographic Guides) , by Louis Frederic, Printed in France, ISBN 2-08013-558-9, First published 1995. A highly illustrated volume, with special significance to those studying Japanese Buddhist iconography. Includes many of the myths and legends of mainland Asia as well, but its special strength is in its coverage of the Japanese tradition. Hundreds of accompanying images/photos, both B&W and color. Essentials of Buddhist Images: A Comprehensive Guide to Sculpture, Painting, and Symbolism. By Kodo Matsunami. Paperback; first English edition March 2005; published by Omega-Com. Matsunami (born 1933) is a Jōdo-sect 浄土 monk, a professor at Ueno Gakuen University, and chairperson of the Japan Buddhist Federation. He received the government's Medal of Honor (褒章 hōshō), Blue Ribbon, for his achievements in public service. 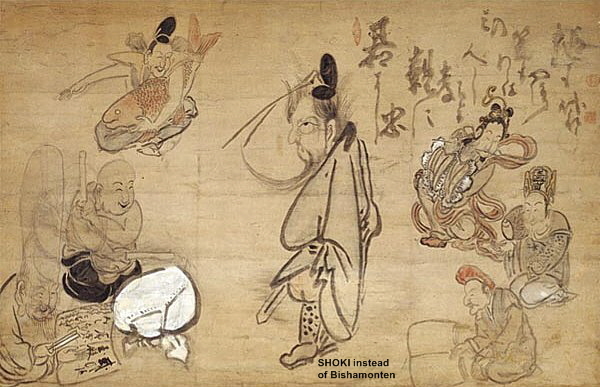 Says Matsunami: “Bishamonten protects from disaster and bodily harm. Daikoku satisfies the desire for food. Benzaiten represents sexual desire. Hotei brings laughter, and Ebisu grants wealth. Tobifudo Deity Dictionary. Ryūkozan Shōbō-in Temple 龍光山正寶院 (Tokyo). Tendai Sect. 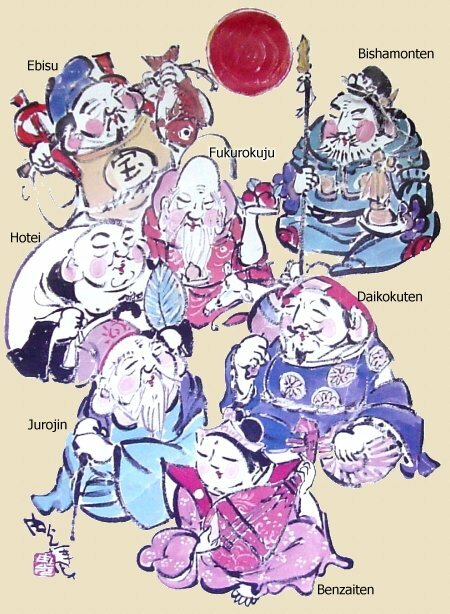 The Seven Lucky Gods of Japan , by Chiba Reiko. Charles E. Tuttle Co., 1966. Also see UCLA Center for East Asian Studies, Educational Resources from teacher Samantha Wohl, Palms Middle School, Summer 2000. See Wohl’s Materials List (based on Chiba Reiko’s book). plus regional folk toys, folk art, handicrafts, and folklore. Modern netsuke of the seven. Visit our Seven Lucky Gods eStore to purchase online.